trust me to share with you only the best of the nbl kitchen recipes. this is a cake i’ve been making for many years. read the ingredients – what could be bad? i usually make this in a bundt cake pan. i’ve also made it in my little mini bundlette pan. i like to do it in the loaf pans when i want to make a special smaller cake. cuz then i’ve got one for the cake i want to serve right away, and another one for later. if you don’t make this cake, you’re a fool. i’ve told you before – you should be trusting me. i don’t post EVERYTHING i cook – only the best stuff. and this is one of the best. my boss / best friend’s birthday is saturday, but she’ll be out of town all week, so i’m making this for her today. she is a true chocoholic. you don’t have to do what i’ve done to the loaf; it’s a really nice textured, rich cake. a dusting of powdered sugar on top is enough. 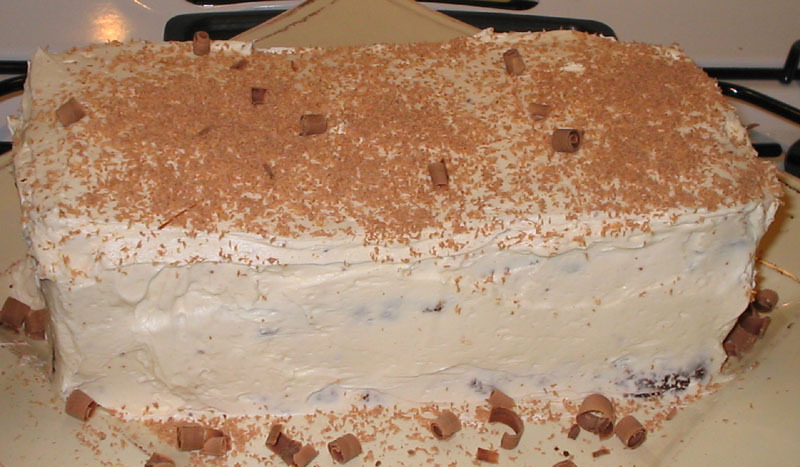 but, since, it’s a birthday cake, i’m cutting it in half and frosting between the layers and on top with an old-fashioned butter cream frosting. the big bundt cake makes a nice christmas present. the bundlettes are nice to serve as part of a dessert selection. or on their own, warm from the oven with a scoop of nice vanilla ice cream. if i have leftovers, i throw the pieces in the freezer to use as the cake ingredient in a chocolate trifle. melt the butter in a small pan with the hershey bars over low heat. mix everything else up together, blend well (you don’t need a mixer if you don’t want to use one). add chocolate and butter to this. GREASE AND FLOUR YOUR PANS! trust me on that one. one big bundt cake – 350 degrees for 1 hour 15 minutes to 1 hour 30 minutes. two loaf pans – 350 degrees for 1 hour to one hour 15 minutes. bundtlettes – 360 degrees for 40 to 60 minutes. keep checking! There is a very long list of reasons why I want to come back to visit you guys. This cake is getting added to the list. How many Hershey bars? I'm not quite sure I understand. I'm thinking of using this for gifts for people in my office.